At one time, there were over 60 gun batteries in operation around the island. They were constructed in strategic positions to protect the coastline from possible landings by the French. Typically they consist of a sloping paved stone platform to carry the ordnance, together with a brick or stone lined barrier as defence against oncoming fire. A number of batteries have been cleared of overgrowth in recent years and restored as historic sites. A magazine building would originally have stood nearby to store powder and shot. In some cases the magazines still survive though the battery has been lost. Built around 1793 to help protect the northern approaches and the channel between Guernsey and Herm. Originally it mounted two 18 pounder canon, but by 1816 mounted two 24 pounders and had been provided with a permanent magazine. The magazine lay to the west but is now lost. Address: To the north of Beaucette Marine, Vale. Accessible via La Lande, Vale. Parking: Public car park nearby on Fort Doyle headland. This battery mounted three cannon. There is an associated magazine behind the gun emplacement. Parking: Public car park on La Route de Jerbourg. This battery platform, situated above Fermain point had an associated with magazine and watch house. Address: Accessible via footpaths from Fermain Bay and Becquet Road, St Peter Port. Parking: There is no public car park nearby. On street parking may be possible in Becquet Road. Accessible via signposted footpaths from La Giffardiere or the coast road. Parking: On-street parking possible in La Giffardiere or in the public car park at Cobo. Accessible via cliff paths or foothpath from La Valette. Parking: Parking at La Valette. Parking: Public car park at Delancey Park accessible via Mont Morin. This substantial battery is associated with Tower 15 at Fermain and a magazine. Parking: There is no parking at Fermain. Constructed c.1779 it was armed with three 24 pounder guns and was serviced from a powder magazine located some distance from the battery. The battery was altered by the German occupying forces during the Second World War. Young and old will enjoy exploring the gun positions and trenches across the site. Parking: Parking at Grandes Rocques headland. 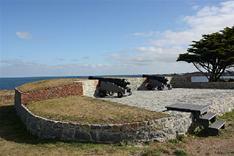 The right and left batteries were constructed in 1796 and have commanding views over Vazon Bay. The batteries would have been manned by the North (2nd) regiment of the Guernsey Militia with each battery supporting two 18 pounder cannons. Address: Rue de la Hougue, Castel. Parking: There is no dedicated parking. It may be possible to park nearby but please do not block the road. In 1801 this battery mounted two 18 ponder guns; it would have guarded the northern side of L'Eree Bay. Today two cannons stand on the site guarding the headland. There are spactular views over to Lihou Island and towards Pleinmont Point. Address: L'Eree headland, St Pierre de Bois. Situated close to the Chouet Tower this battery would have guarded Grande Havre and the Braye du Valle which once separated the Clos du Valle from the rest of Guernsey. The two platforms make up the battery and each would have accommodated one 24 pounder cannon. Accessible via coastal footpath from Chouet. High on the cliffs at Jerbourg this battery overlooks the inaccessible Havre des Moies Bay. Parking: Closest public car park is at Jerbourg. In 1816 the battery mounted one 20 pounder cannon and had a portable magazine. The defensive parapet has not survived. Accessible via footpath from Baie de la Jaonneuse or Pembroke Bay car parks. Parking: Public car parks at Baie de la Jaonneuse or Pembroke Bay. This battery overlooks the south coast of Guernsey and had three gun emplacements. Parking: Public car park at Les Tielles headland. This battery dates from at least 1816 and evidence for a small building to the rear indicates that it may have had a magazine. It may have been superseded by Jerbourg Battery on the higher ground to the west. Parking: Public car park at Jerbourg headland. Parking: Public car park at Le Catioroc headland. This small battery was also known as Narrow Point, Narrow Port or Grade Port Battery. It consists of a small platform which mounted a single 9 pounder gun. Parking: Public car parks at Portelet Harbour and Pleinmont headland. This battery is situated on the eastern side of L'Ancresse Bay. It was associated with Tower 5 and has a magazine. Accessible via footpaths from eastern L'Ancresse Bay car park. This battery provided extra protection to Perelle Bay as it sits between Mont Chinchon Battery and Fort Richmond. It mounted two 20 pounder guns in 1816 and originally had its own magazine but this has been destroyed. The battery has been partly reconstructed. Parking: The nearest public car park is at Le Catioroc. Situated high on Pleinmont point this small battery would have had a strong defensive position. In 1816 it mounted one 18 pounder gun. Accessible via pedestrian road from Portelet Harbour or cliff path from Pleinmont headland car park. Parking: Public car parks at Portelet Harbour or Pleinmont headland. This battery had one gun position which was protected by a small parapet. It was armed with one 20 pounder gun. It did not have an associated magazine but rather would have been serviced by a portable magazine. Accessible via coastal footpath from Port Soif car park. Parking: Public car park at Port Soif. Parking: Public car park at Rousse headland. This battery would have been manned by the South (3rd) Regiment of the Guernsey Militia. In 1803 this battery had two 24 pounder cannons. Address: Accessible via footpath from Saints Harbour, Forest. This battery has an associated magazine. In 1816 this battery mounted two 24 pounder guns. Address: Accessible via footpaths from Petit Bôt Bay, Forest. Parking: Pubic parking at Petit Bôt.